Here are the results of the finals played on Thursday 10th May 2018. Thanks to all who supported the tournament. There were 24 entrants with 3 injury retirements across the competition. There was a good turnout in finals night so thank you all for those who were able to support the event. Those who attended were treated to 2 excellent and highly competitive matches. Having got his quarter final and semi final in just in time to make the final, Neil was unfortunately struck down by a sickness bug that robbed him of the chance of a showdown with Sam. 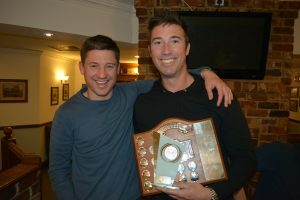 Sam has beaten Neil more often but this year could have been Neil’s as he was in fine form going into the competition. Shame as we would have loved to see how this one turned out but we’ll just have to wait for next year. Gary started well winning the first few points but it didn’t take Ashley long to start playing and assert himself and take the first game 15-11. 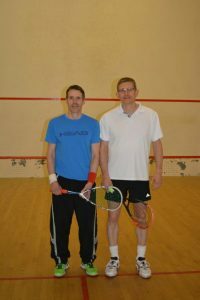 Gary, playing right handed, was probably suffering a bit after a long and tough semi final the night before coming through 3-2 against Duncan Brownlie. Some great retrieving by both players meant that there were some tremendous rallies but Ashley’s destructive finishing ensured he moved relentlessly to a 3-0 victory. Thanks to Steve Kane for marking. A tough competitive game. Derek took the first 16-14 and Mike was spurred into action taking an 8-0 lead in the second, going on to win it quite comfortably to make it 1-1. The 2nd and 3rd games were much tighter but Mike always kept his nose in front and and found the right shots at crucial times to win the match 3-1. The next tournament will be the handicap cup in September/October. Previous PostPrevious Cheltenham Civil Service AFC Most Successful Year Ever ?